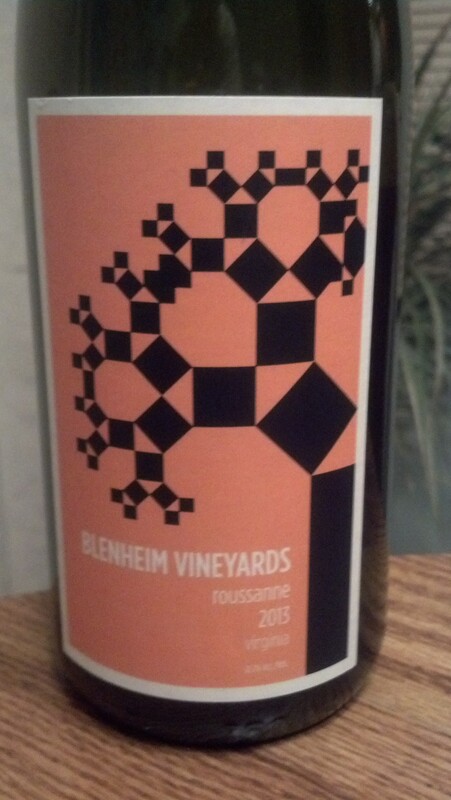 Blenheim Vineyards Roussanne 2013 | Wine Splash! Rich, racy, and fruit forward……I wish I could drink this Roussanne all day! Normally Roussanne is used as a blending grape but Blenheim has weaved a wonderful white wine that is 100% Roussanne. And I can`t remember the last time I had a decent Roussanne! Aromas of peach, citrus, and herbal tea bring on thoughts of a warm summer day. Medium to full bodied and soft across the palate. Bright flavors of Asian Pear, stone fruit, and white peach tease my taste buds. On the second sip, flavors of star fruit with hints of oak and honey lead to a long, pleasant finish. The flavors all fused together like a concerto on my palate with all the instruments playing in harmony. A fun wine to sip with appetizers at a party but still serious enough to bring to a black tie affair. Pair with baked chicken, parmesan crusted tilapia, pasta with a white (alfredo) sauce, or garden salad with grilled chicken. This flavorful white wine was a wonderful surprise tonight and feel it deserves a strong 91 points. Blenheim Vineyards is located in beautiful Albemarle County near Charlottesville, Virginia. The main winery building was designed by singer/songwriter Dave Matthews and master craftsman William Johnson so that the building would have a minimal impact on the environment. A definite stop along the Monticello Wine Trail to immerse yourself in great wines and beautiful scenery! If you can’t make it to the winery to buy a bottle, you can also order from the winery online at http://www.BlenheimVineyards.com. But make sure you live in a state where your wine can be legally shipped to. So open a great bottle of Blenheim Vineyards Roussanne, pop in your favorite Dave Matthews CD, and do the “Two Step” because now life is good. WineSplashing! !